Finally Ducati has been taken over by the Audi AG from Investindustrial Group. The acquisition happened very quickly where some Indian automobile companies were also involved initially. The registered office of Ducati Motor Holding S.p.A. is in Bologna. The final transaction formalities will be done as fast as possible once the competent authorities authorize the procedure. The acquisition has been approved a day earlier by the Audi AG and Volkswagen AG in Hamburg. Ducati is known globally for its leading brand in motorbike production where it has the extraordinary expertise in engine design and development while complementing it with a lightweight construction. 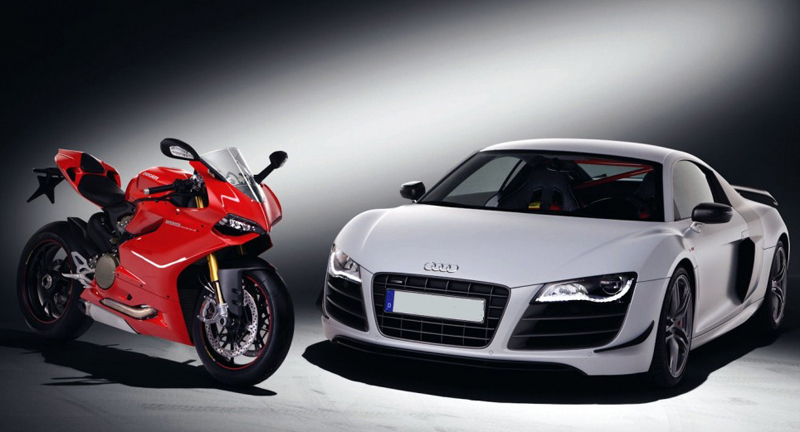 Ducati has become the third pillar for the automobile manufacturing brand Audi AG in Northern Italy other than the two traditional Italian brands Italdesign and Lamborghini. This way another part for further construction towards the growth strategy for the firm is ensured. As per the declaration made by the Chairman, Board of Management, AUDI AG, Rupert Stadler, “Ducati is known globally as an exclusive brand among the motorbike makers and has a lengthy tradition of constructing sporty motorbikes. The expertise in building magnificent engines of high-performance capacity with lightweight body construction has earned it a huge fan base that consequently turned it into the globe’s most profitable motorbike maker. This attribute makes Ducati absolutely fit for a super brand like Audi”. The combustion chamber of Ducati’s engine has a special in-built process to it for generating massive power that combines with a system of progressive controls give it a very sporty character. This attribute integrated to the extensive knowledge of Ducati’s know-how in constructing the lightweight chassis and body offers great business potential for AUDI AG and the Volkswagen Group. Chairman, General Works Council, AUDI Ag, Peter Mosch confirms that the emissaries of the employee at AUDI AG support the firm’s codetermind and sustainable strategy of growth. Peter Mosch further added, “We should utilise this opportunity offered by the globalization for Audi-and that is what we are doing accurately. Everyone in the Audi firm is enthusiastically waiting to work with our new team mates from Ducati.’ Ducati is a worldwide active firm with its production operations running at Bologna where its headquarter is based, while its own manufacturing facility is in Thailand. It has a good arrangement of a chain of importer firms placed in strategic markets all over the world. If what automobile experts predict is to be deemed correct, then we all are to see a strong growth of motorbikes in the next few years, mainly in Asia. Ducati sold nearly 42,000 units of motorbike in the year 2011 from which it earned a revenue of around EURO 480 million while it has 1,100 employees working for the firm. In 1926 this firm was founded in Bologna by Macello Ducati and Adriano. Then it was originally known as the Societa Scientifica Radiobrevetti Ducati, where it used to build radio parts. In 1949 it got into the motorbike manufacturing business. For many years now Ducati has been actively participating in the motorbike racing on the track through its separate division for racing, Ducati Corse. At the moment the Ducati Corse is focused on the preparation and performance of the official factory team in the MWC (Motorcycle World Championship) and in the SWC (Superbike World Championship) for its MotoGP class. Here it supports competitive private teams for the race. In the 21 competitions of the manufactures’ championship it won in 17 times in its class and in 14 times in pilots’. CategoriesFeatured, Latest News TagsAudi AG, Ducati Motor, S.p.A.